If you enjoy a satisfying cup of tea or are looking for a quicker and more efficient way to heat water for other uses, a tea kettle is a must. Our team performed in-depth research on tea kettles – looking at stovetop kettles, electric kettles, tea kettles with infusers and kettles for camping – to curate this list of recommended products. Learn more by reading our helpful buying guide and detailed reviews below. Read more about our methodology. The Premium Whistling Tea Kettle by Vescoware is a stainless steel wonder kettle for the tea lover. With a chic design, and durable materials the 12-month limited manufacturer’s warranty seems generous. This kettle also works well with all heating sources, including open flame. The Vremi Whistling Tea Kettle is the perfect affordable option if you're looking for a great stovetop kettle without breaking the bank. Available in an array of colors, this stainless steel kettle is modern and perfect for personal use. With a clever design and a triple-ply construction, the Oxo Good Grips Uplift Tea Kettle makes for the best stovetop kettle option. This kettle performs equally well with gas and electric stoves. If you prefer a kettle that does almost of the work for you, then the Hamilton Beach 1.7L Electric Kettle is the perfect buy for you. With its cord-free design and hidden heating element, this kettle is easy on the eyes. Tackle two tasks at the same time -- heat water and prepare loose leaf tea. This glass tea kettle is microwave and stovetop safe. Take tea time to the great outdoors with the GSI Outdoors Glacier Kettle. This stainless steel kettle is ultra-light and designed to perform over an open flame. Tea kettles can be broadly categorized by how they heat water. Most kettles heat water either on a stovetop or by way of an electric heating element. Stovetop kettles are a great option for home use, while electric tea kettles are great for offices and other places without a stove, though they are also good for home use. Some stovetop kettles also can be heated with an open flame, making them a good choice for camping. Size is a consideration when purchasing a tea kettle. If you have a family of tea lovers, you'll want to select a larger kettle, so there is plenty of hot water to go around. Tea kettles are pretty straightforward. However, some do boast added features. Common features to look for are soft, heat-resistant handles for stovetop kettles. There also are features to ensure that your kettle doesn't boil dry, which can damage the kettle or, worse, cause a safety hazard. These include whistles on stovetop kettles and auto-pause on electric kettles. Also, some kettles come with infusers, so you can prepare loose leaf tea as you heat water. You can get a serviceable stovetop tea kettle for well under $20, although the materials may be of cheaper quality. Higher quality kettles run between $25 and $60+. Electric tea kettles range from $15 to $40+. If you're looking for a large, tough kettle, then look no further. Beauty meets functionality with this tea kettle. This premium kettle is easy to clean, large enough to fit 10 cups of water, and has a gorgeous design. The high-quality reflective steel is perfect for all heat sources. The durable, cushy handle also offers absolute comfort when holding the kettle. Good for outdoor and indoor use. From camping to household use, this kettle works in various environments. With its premium body and heat resistant handle, this teapot works exceptionally well with various energy sources. This could be your favorite multi-use kettle. Great warranty. With all the positives of this item, the fact that it has a 12-month limited warranty could be a huge plus. Having this guarantee will protect your investment without all the fuss. Premium quality comes at a price. There are other, cheaper kettles that may be better suited for your needs. 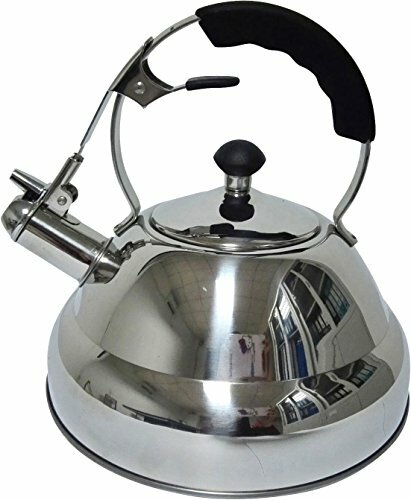 An affordable stainless steel teapot is not difficult to find. However, one with a modern look and fun colors is another story. Thankfully, Vremi has given us the perfect option. Able to hold 2 quarts, this kettle is perfect for personal use. If you enjoy a cup of tea here and there or have a small household, then this could be your best bet. 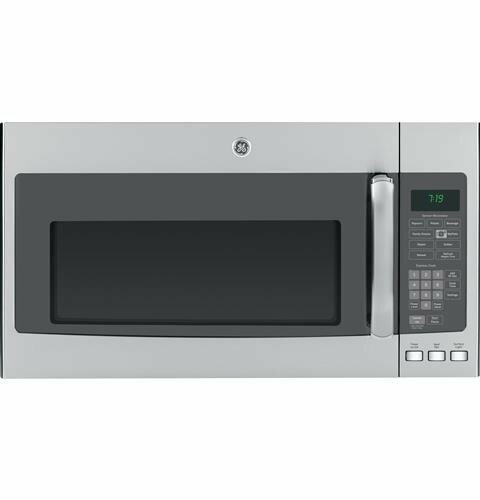 The retro design is cool, but doesn't skimp on quality with its food-grade brushed stainless steel body. Decorative appeal. 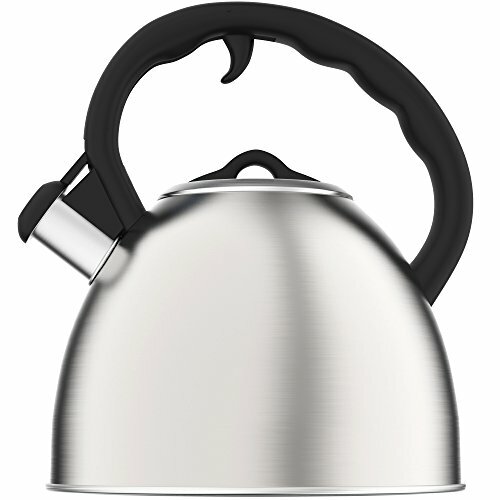 This tea kettle comes in five beautiful colors, black, white, silver, red, and blue. 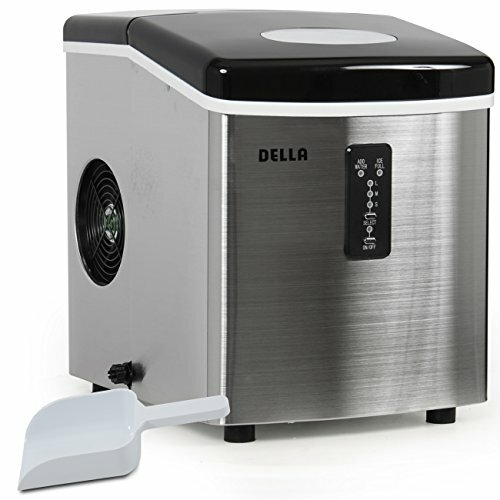 The 2-quart body is rounded, and smooth lending it a very modern look without being eclectic. Small size for personal use. This kettle is great for small batches. If you live alone or are the only one in the household who enjoys a warm beverage, then you have found the perfect option. High-quality body. With such an affordable price tag, you’d think they would have skimped on quality. 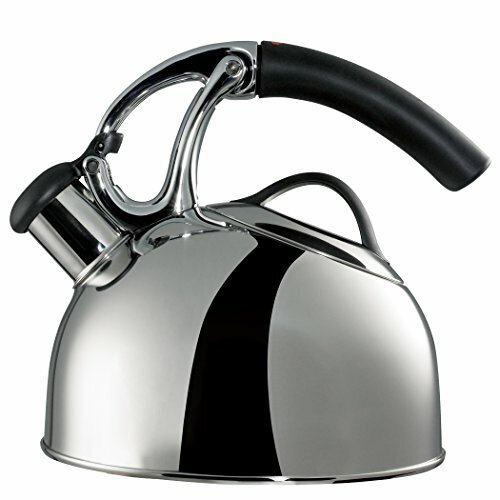 However, this kettle features a beautiful food-grade brushed stainless steel body. Highly affordable. Anyone can afford this option, making it the perfect budget buy. You can get more bang for your buck with the Vremi Whistling Tea Kettle. On the smaller side. If you're preparing tea for s large group, you'll find yourself heating multiple pots of water to serve everyone. Perfect for home use, this is the classic tea kettle. Just fill it with water, heat it on the range and listen for the whistle. While the design and function of these kettles have changed little over the years, today's stovetop tea kettles often have newer features, such as soft, heat-resistant handles. The OXO Good Grips Uplift Kettle has all the features you would expect from a premium stovetop kettle, including a heat-resistant handle, loud whistle, and attractive polished stainless steel finish. It also has a spout that is designed to automatically open when you pick up the kettle. Easy to use. If you’re looking for a well-designed, easy to use tea kettle, then this is the one. The OXO Good Grips Uplift Tea Kettle has a distinct lift-and-pour design embedded into its DNA. Simply lift the Kettle by its handle, and the spout opens up, ready to pour. Specifically made for the stove top. This is a great kettle for indoor use. It was specifically made to be used on a stove top—gas or electric. This selection was designed with triple ply construction for even heat distribution. Expensive. This is a great, high-quality kettle, but there are others at lower price points that can do the trick, though they may be lacking in durability, appearance, and convenience. Electric kettles are convenient and easy to use. Rather than relying on an outside heat source, such as a stove, electric tea kettles heat water with an internal heat element – just plug in your kettle, and you'll have hot water in no time. Electric kettles are great for offices, hotel rooms and other places where a stove isn't readily available. 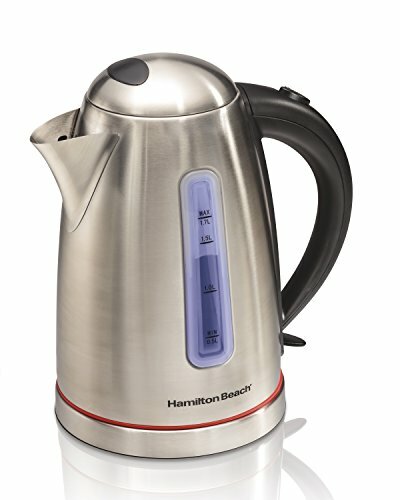 The Hamilton Beach 1.7L Electric Kettle is the perfect option for the modern household. The kettle boils water faster than most microwaves thanks to its 1500 watts power. It is also, of course, a safer option compared to its stovetop counterpart. It’s got a premium stainless steel body as well, adding a long-lasting effect. This kettle is small and convenient, and of course, keeps modern design in mind. The safer option. An electric kettle is a much safer option compared to a stovetop kettle. 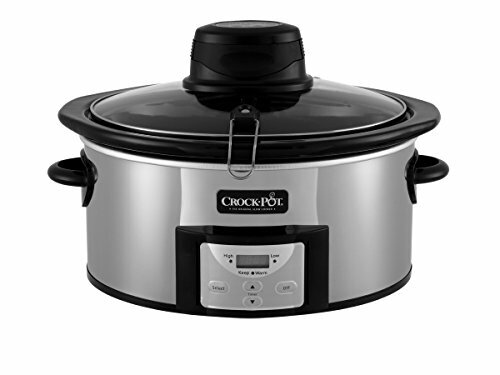 It has its own heating unit that automatically shuts off thanks to Hamilton Beach's boil-dry protection. As opposed to a stovetop kettle, which needs to be watched. Minimal effort. 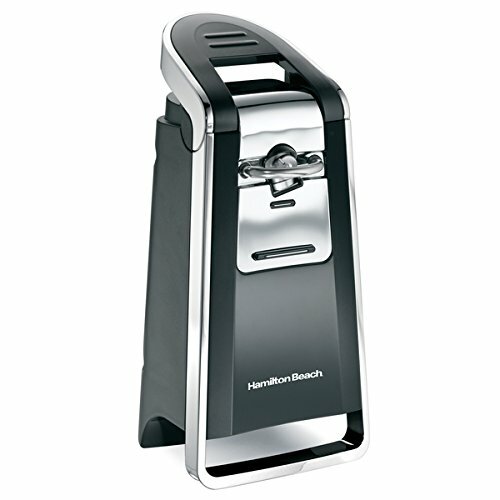 The Hamilton Beach 1.7L Electric Kettle is supper easy to use. All you need to do is fill it up, press a button, and your water will boil. 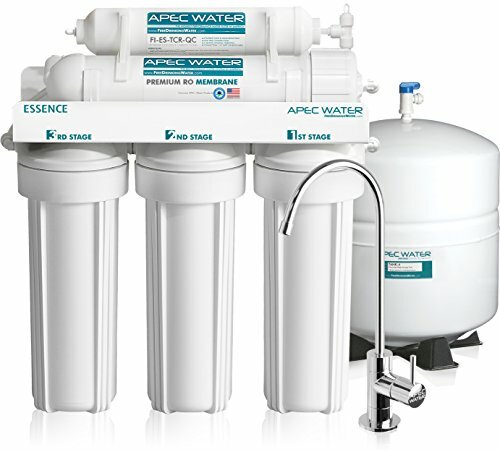 The device automatically shuts off when your water is ready, right after alerting you with a beep. Easy to store. This electric kettle has a cord wind, which hides the cord on the heating unit. This is perfect for storing the device anywhere around your kitchen or home when you’re not using it. Loss of authentic feel. If you’re looking to have an authentic tea kettle, then the electric option isn’t for you. It’s a product designed mostly for convenience. Size factor. With a 1.7L, this may no be the kettle for large groups. However, with a one-push function, it is easier to make multiple batches. For lovers of loose tea, a tea kettle with infuser is a must. Just fill the infuser with tea leaves and add heated water for a great cup of tea. When shopping for a tea kettle with an infuser, be sure to look for an option that is stovetop and microwave safe, like the one on our list. Otherwise, you will have to heat water in a separate container, which can be a hassle. Don’t let the stylish glass body fool you, the Redbird Glass Teapot with Stainless Steel Infuser is an incredible, affordable option. The durable borosilicate lab glass is FDA approved. The pot and lid are dishwasher safe, and free of BPA and lead. The removable infuser basket is also made out of 304 stainless steel with thousands of micropores for maximum flow and steeping control. A versatile tea kettle. The infuser is great for preparing loose leaf tea while heating water. But if you just want to boil water, the infuser is removable. Heating options. Unlike some glass tea kettles, the Redbird Glass Teapot is safe for the stovetop and the microwave. Beautifully designed. 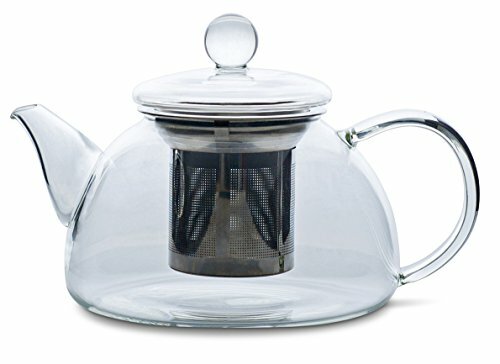 This clear glass tea kettle has a clean, pleasing design that will look great whether or not the kettle is in use. Awkward lid placement. One thing customers have noticed is that the lid can slip when you’re trying to pour from the pot. You should always hold it in place just in case. Just because you're roughing it in the great outdoors doesn't mean you have to forego all of the comforts of civilization – namely a satisfying cup of tea. That's where tea kettles for camping come in. These kettles are ultra light – so you can pack them easily in a backpack – and they work well over a campfire and on a camp stove alike. Whether you're a car camper or an avid backwoods backpacker, the GSI Outdoors Glacier Kettle is for you. Durable and ultra-light works equally well over an open flame or on a camp stove. And the lid has a tight, snap-release lock, so it won't slip off when the kettle is over the flame or when you're pouring hot water. Made for the outdoors. When looking for a good kettle to take camping, you want one that was designed with the outdoors in mind. If you enjoy backpacking as much as you enjoy tea, then we’ve found your travel companion. Extra-large lid. 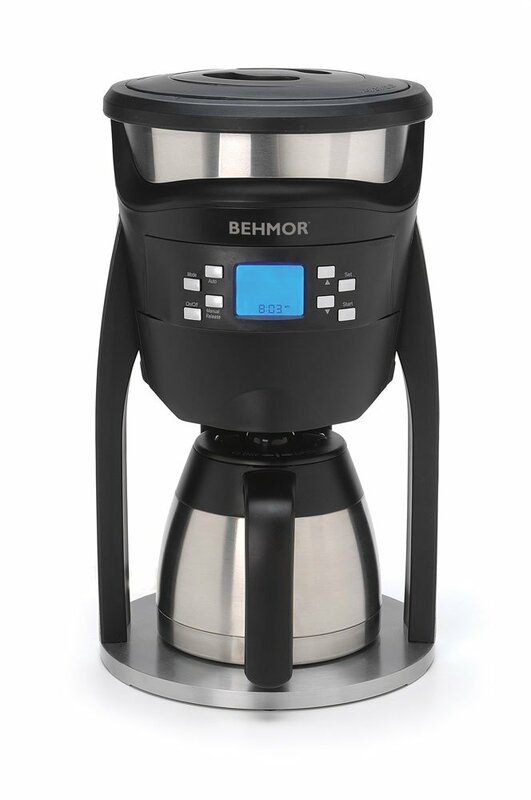 With a very large lid base, spills when filling the kettle pouring water prior boiling is virtually eliminated. The lid stays locked when pouring, so there’s no need to put your hand on it and risk hurting yourself. You can also bring it inside. 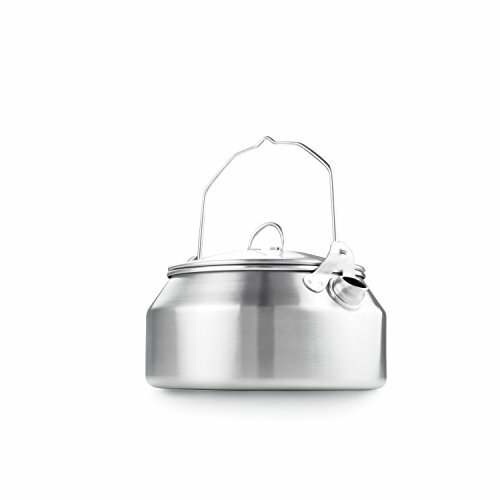 Despite being the perfect outdoors option, the GSI Outdoors Glacier Stainless Tea Kettle can also easily be used inside. Some customers strictly only use this kettle on the stove top and still rave about it. 1-quart room. If you are traveling on your own and want to make a pot of tea for yourself, this kettle is perfect. But if you drink a lot of tea and your also traveling in a group, sharing may be difficult.